Brussels, Belgium (CNN) -- U.S. Secretary of State Hillary Clinton hailed the pledges by NATO members and other allies to send 7,000 more troops to Afghanistan to battle Taliban and al Qaeda extremists and train Afghan forces. Clinton and NATO Secretary General Anders Fogh Rasmussen said on Friday that Britain, Italy, Poland, Slovakia and non-NATO member Georgia are among at least 25 countries offering to send the forces, with more expected in coming weeks and months. "We need both more numbers than we have just with our own troops and we need more specific functions," Clinton told reporters after talks with her NATO counterparts and other countries contributing to NATO's International Security Assistance Force (ISAF) in Afghanistan. "We have gone a very long way toward meeting those needs today." The new troops will augment the 30,000 additional American troops that President Barack Obama announced he was sending to Afghanistan as part of a new initiative to stabilize the country. "ISAF will have at least 37,000 more soldiers in 2010 than it did this year," Rasmussen said. "That is solidarity in action." Defense Secretary Robert Gates signed an order Friday to deploy the first wave of troops to Afghanistan as part of Obama's new strategy, a defense official confirmed to CNN. Approximately 1,000 Marines are expected to deploy this month, military officials told CNN previously. The Army may not deploy the first soldiers until at least March, Army officials said Friday. Britain, the largest troop contributor after the United States, added an additional 500 troops this week, for a total of 9,500. Italy is adding 1,000 more troops, boosting its force to 3,800. "Every single government needs to ask themselves whether they are doing the maximum possible on the military and civilian side to ensure success in Afghanistan," British Foreign Secretary David Miliband said. 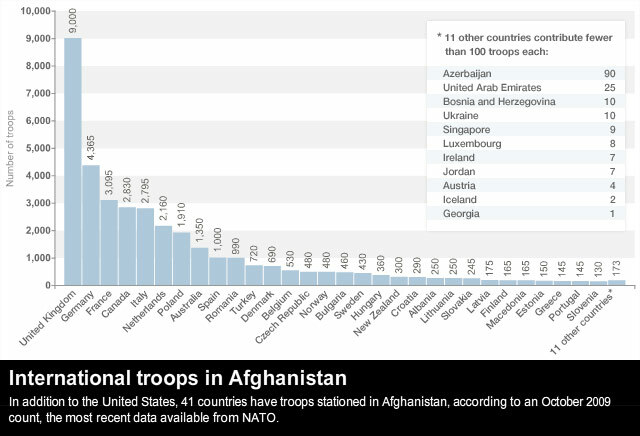 Clinton praised both Britain and Italy, as well as Georgia, whose new total of 1,000 troops makes it one of the largest per capita troop contributors in Afghanistan. She asked Turkey to send more troops and urged the Netherlands to reconsider its plans to being pulling out its 2,100 troops next year. Pressure is mounting from major countries like France and Germany, both of which have balked at sending more troops, to add reinforcements. Germany this week extended the stay of its 4,400 troops by another year, despite rapidly increasing public support for the war. "It doesn't make sense to reduce the public debate over success of the mission in Afghanistan to the number of troops -- yes or no to more soldiers," German Foreign Minister Guido Westerwelle told reporters. French Foreign Minister Bernard Kouchner said the country's troop numbers -- 3,100 service members -- were adjusted last year and if the country sees a need to change its deployment, it will do so. But Rasmussen said he had indications both countries would contribute more troops, and he suggested they were delaying announcements until after an international conference on Afghanistan scheduled for January 28 in London. "I have been encouraged by the latest signals from the French government," Rasmussen said. "I think, like Germany, they will await the international conference." Russian Foreign Minister Sergey Lavrov said Russia would continue to allow cargo shipments through its territory to help supply NATO forces and maintain its training of Afghan law enforcement and counter-narcotics officials. But he said that Russia would not take on a military role in Afghanistan. At present, there are 68,000 U.S. troops operating under both NATO and U.S. commands, and around 42,000 non-U.S. forces under NATO. Despite Obama's announcement of a July 2011 date to begin withdrawing U.S. forces, Rasmussen stressed such a transition would be "conditions-based" in each province, and only when Afghan forces are capable. "There is no doubt the going will be tough, no one should expect instant results," he said. "But it will not be a run for the exit." Acknowledging "our people are weary of war," Clinton told her NATO counterparts the new troops are critical to winning the eight-year-old war, but the commitment won't be open-ended. "The need for additional forces is urgent, but their presence will not be indefinite," she told the North Atlantic Council, NATO's main political body. "Even as we signal resolve through the deployment of additional forces and a long-term civilian commitment, we want to send a signal that our combat presence is not permanent, and to provide a sense of urgency to the Afghans to do for themselves what we know they're capable of doing," Clinton said, noting the July 2011 date President Obama announced to begin withdrawing U.S. forces. Her quotes and comments come from a State Department transcript. Gen. Stanley McChrystal, the top American commander in Afghanistan, also attended the meeting of the North Atlantic Council to explain the mission, which he has sought to redefine since taking command in June. Clinton sought to sell U.S. allies in Afghanistan on a unity of purpose, acknowledging that governments have to sell the additional troops to skeptical publics at home. "The United States has reaffirmed its commitment. We look to our allies and our partners in ISAF to join us. We are in this together. And only together can we succeed, she said. "We have come together in NATO and in ISAF because we recognize that our security is shared -- that we have a collective responsibility." 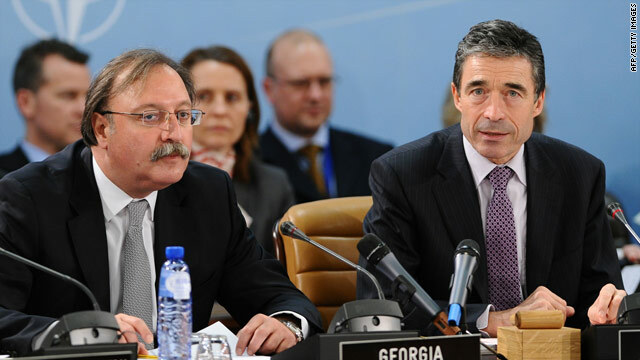 Both Clinton and Rasmussen stressed the need for both NATO and non-NATO partners in Afghanistan to augment and coordinate civilian and development assistance along with the troop increase, as part of a long-term strategy for the region. And they both spoke of the joint responsibility of the Afghan government to take concrete action on issues like corruption. NATO and ISAF officials tell CNN part of the role of the additional troops in Afghanistan will be to collect actionable intelligence on corrupt Afghan officials, which they will then turn over to the Afghan government to take action. "No initiative will work without concrete action from the (Afghan) government," Rasmussen said.